For the nature enthusiasts, there’s no shortage of ways to spend your time on Grand Bahama Island, with its miles of shoreline, varied ecosystems and the popular Lucayan National Park. The vibrant reef system supports a thriving marine eco-system that remains unspoiled, with miles of mangrove shoreline and estuaries teeming with fish and bird life, and powder soft sandy beaches that make for postcard images. Upland, Grand Bahama Island exhibits six distinct eco-systems: pine forest, blackland and whiteland coppice, rocky coppice, mangrove swamp and beach. Each can be turned into a day of discovery! For thrills that will make your friends back home envious, try feeding tiger sharks underwater on the famed “Tiger Beach”, or explore Ben’s Cave with its 5 miles of underwater caverns of stalactites, stalagmites and fossilized conch shells. For the claustrophobic, opt for an afternoon snorkeling with trained dolphin, or a scuba encounter with their wild relatives. 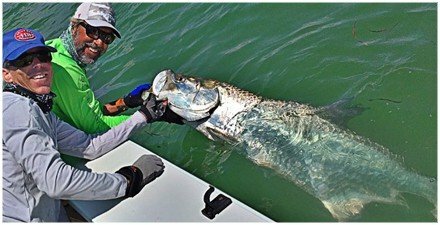 Below are a few of the amazing adventures that await when you make Old Bahama Bay, a Guy Harvey Outpost Expedition property your next stop on the journey we call life! Whether you’re a certified scuba diver or not, don’t leave Grand Bahama without enjoying a truly unique experience swimming and interacting with trained dolphins under the guidance of the professionals of UNEXSO. Four times each day, a ferry departs UNEXSO, located in Port Lucaya, for a 20 minute ride along the south shore of Grand Bahama Island to go to Sanctuary Bay, where the dolphin lagoon is located. 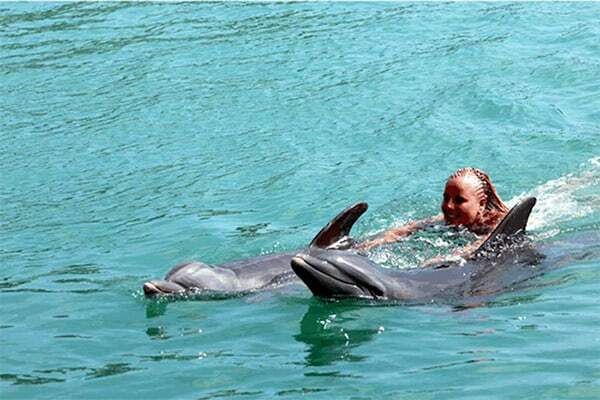 Here, for non-divers, you’ll enjoy interacting with friendly, trained Atlantic bottlenose dolphins. 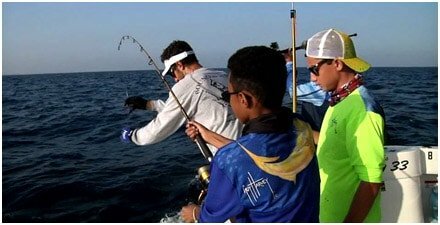 You can observe and photograph the dolphins, participate in a swim with them, sign up for an assistant trainer program or experience scuba diving with the dolphins in open water. For certified divers, the Open Ocean experience could very well be your most favorite diving experiences to date! Your support boat will leave from Sanctuary Bay with dolphin trainers aboard, followed alongside by two leaping Bottlenose Dolphins. On site, in the clear, reef-lined water almost directly offshore, guest divers settle on the sand bottom 45 feet deep. The dolphins and their trainers make the rounds, giving each diver plenty of time to touch, feed and photograph the dolphins. Watching these graceful creatures frolicking in front of you is an unbelievable experience, but the most unforgettable reward is always a memorable dolphin kiss! Grand Bahama Island is the most northern island in the archipelago of the Bahamas, 530 square miles in size, boasts all six different ecosystems found in the Bahamas, and has 18 of its 29 specialty birds not commonly found in North America. Grand Bahama Island is classified into three sections; West , East and Central (Freeport) and each offers something special in landscape and bird watching. Birding experts favor West End as the best location for birding in mid to late March, during a period known as spring migration when the many island species assemble in the area before beginning their annual exodus to breeding grounds back on the mainland. The largest of the six ecosystems on Grand Bahama is the great Pine Forest, an ideal place to find Zenaida Doves, Pine Warblers, and Olive Caps, Bahama yellow throats, Brown-headed Nuthatches and Flycatchers like the Loggerhead Kingbird and the Crescent-eyed Pewee. The sandy and rocky coast line, Mangrove marshes and golf courses are home to many more exotic species. For birdwatchers and nature lovers, the island is a true mecca, a place where they can see 18 of the 28 species of Bahamian birds that are not seen in the U.S., Canada, or Europe. 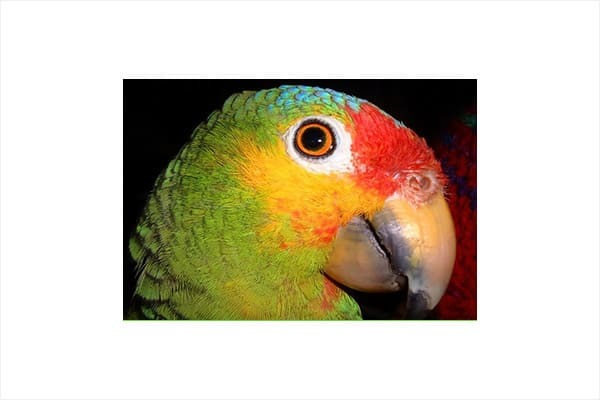 For the best in Birding adventures, we recommend a tour with Calabash Eco Adventures. To learn more, click here. Calabash Eco Adventures is a tour company that provides educational tours from West End to East End with destinations throughout, including local settlements and remote areas of Grand Bahama. Under the guidance of native tourism guide, Shamie Rolle, the company offers biking, hiking, snorkeling, birding, and kayaking tours. Mr. Rolle is one of only four individuals licensed by the Bahamas government to offer the unique adventures of cavern dives at Owl’s Hole in Old Free Town and Ben’s Cave within the Lucayan National Park. These are adventures not to be missed! 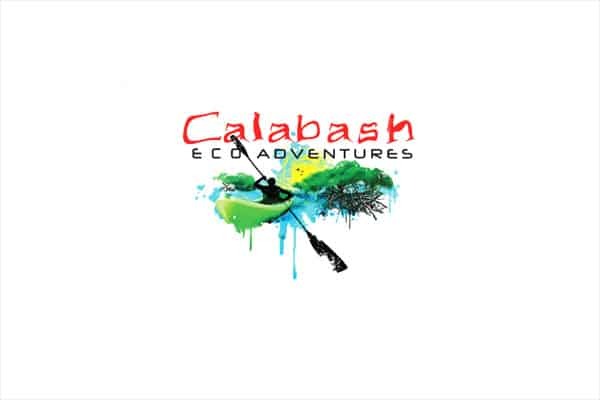 To learn more about Calabash and the tours the company offers, click here. At the 40-acre Lucayan National Park, about 25 miles east of Freeport, take a self-guided tour through the well-labeled trails dotted with wild guava, tamarind, towering Caribbean pines, and gumbo-limbo trees. Unique to the preserve are the Lucayan tunnels, the longest surveyed underwater cave system in the world. When the caverns are hit by sunlight, the water turns a dizzying blue. Just outside the park entrance is Golden Rock Beach, without question one of the most beautiful beaches in all of the Bahamas. The Caverns and Golden Rock Beach are consistently ranked among the best nature attractions of Grand Bahama Island by TripAdvisor. The Rand Nature Centre, local headquarters of The Bahamas National Trust, is a birders delight. It is home to West Indian flamingos, Antillean Peewee birds, Red-legged Thrushes, Stripe-headed Tanagers, and the endangered Bahama Parrot. The Centre maintains a small library with bird books and field guides and can provide information on other ideal birding spots. The Nature Center is open for self-guided tours, 9 a.m. – 4 p.m. Monday – Friday and is closed on Saturday, Sunday and on holidays. Guided tours available on Tuesdays and Thursdays 10.30 AM. It also provides educational tours and is a great resource facility for ecological subjects. Among its programs geared to school children is “Adopt An Animal For Your Class,” which helps children to learn above native animals and assist in conservation efforts. Garden of the Groves is a Grand Bahama nature experience not to be missed! Certified as a Wildlife Habitat by the U.S. Wildlife Federation, the Gardens is a twelve-acre park dedicated in 1973 to Mr. Wallace Groves and his wife Georgette, founders of the city of Freeport. Explore winding trails through lush vegetation, cascading waterfalls and sparkling fountains. Visit their picturesque chapel, which has been consecrated and is a favorite place for weddings, prayer and meditation. At Garden of the Groves indigenous and migratory birds and butterflies sip nectar or take insects from the many flowers and shrubs that were newly planted to provide nectar, insects and berries for wildlife. Guided tours are offered by naturists certified by the Bahamas Ministry of Tourism who enjoy sharing their knowledge of the flora and fauna of the Garden as well as the birdlife. Guided tours are offered daily at 10:00 am. Duration of the tour is approximately one hour, and cost $15/person. For a map of the Garden, click here.